The difficulties of capturing a live show have been well-documented. In the past, a professional multi-track audio recording involved choosing a gig in advance (often one in a major city) and hiring a mobile studio - which inevitably meant that many of the very best shows went unrecorded. Hence the need for bootlegs and board recordings. Fortunately, advances in digital technology have made life somewhat easier. 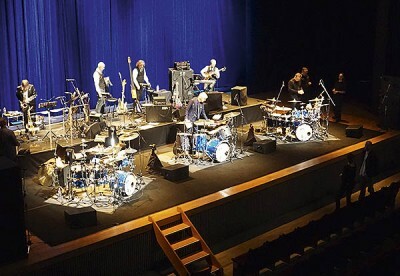 Nowadays, all shows can be captured in high resolution using multitrack digital hard drives (even if three drummers do drive the systems to their limits, requiring 42 inputs just for the three of them). So in choosing performances by this band, we were blessed with high resolution multitrack recordings of all their concerts. Thankfully Jakko Jakszyk bravely took on the task of listening to all of them, which once fell to me. Video, however, introduces a different dimension. The presence of cameras and cameramen introduces a fourth intrusive element into the relationship between the artist, the music and the audience. It is therefore something of a truism in the history of Crimson that any show that is filmed will not be one when heaven meets earth and the angels descend. Our solution was to return to the concept of "BootlegTV" and prioritise the music and the performance rather than the pictures. We embedded a single cameraman (the long-suffering Trevor Wilkins) on this tour, and he filmed every night with a series of cameras hidden discreetly on the stage where they would intrude on neither artist nor audience. The compromise is thus in the visuals and not in the music. This is, of course, a re-imagined concert. We have expanded the show at Takamatsu on which much of it is based with songs from elsewhere, honouring the original setlists wherever possible, regardless of whether this creates visual "continuity errors". There is a button to play the show without the pictures for anyone troubled by this post-modern approach. And on the CDs, we have dispensed with the audience entirely, giving a surprisingly different perspective on the music. King Crimson re-imagined. Radical Action to Unseat the Hold of Monkey Mind. "The question is its answer."